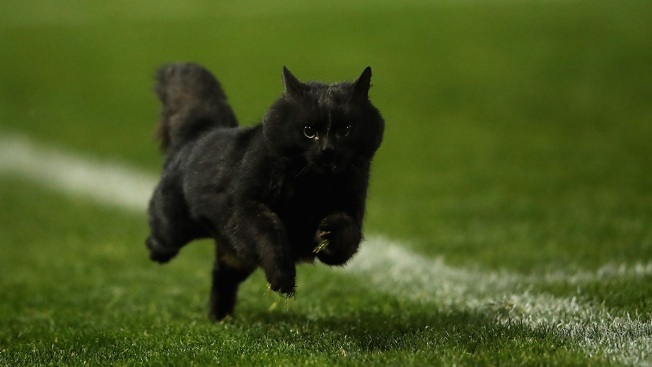 In this file photo, a black cat enters the field of play at Pepper Stadium on July 10, 2016 in Sydney, Australia. It is believed to be bad luck to run into a black cat on Friday the 13th. There's nothing superstitious about Friday the 13th as two towns celebrate the day with tours or tattoos. Lehighvalleylive.com reports people wear hockey masks just like the killer Jason Voorhees did in the film and tour a Boy Scout camp where the film was shot. Two actors also will be in town for paid events. Meanwhile, Ghostrider's Tattoo Studio in Lubbock, Texas, is offering piercings and tattoos for $13 for the fifth year in a row. With tip, customers will pay $20 for what usually costs a minimum of $50. Others elsewhere will spend the day trying to avoid black cats.